The second translation of the Beer and Health booklet is finished. This Romanian version has the title “Berea şi sănătatea – Consumul moderat ca parte a unui stil de viaţă sănăto”. 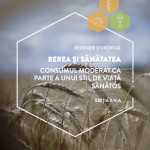 The Romanian Centre for Studies on Beer, Health & Nutrition (www.beresanatatenutritie.ro) organized the translation. The Romanian translation can be obtained in clicking here.